The Frost School of Music at the University of Miami presents the 2018 Frost Legacy Award to long time patrons and supporters of Winter Wonderful Patti and Allan Herbert for their philanthropic contributions to the arts, their commitment to the health and wellness of the community, and their generous support to the Frost School of Music. 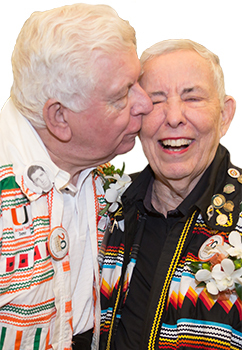 The Herberts, who celebrated their 60th wedding anniversary in May 2018, are pioneer South Florida residents who met and fell in love while attending the University of Miami in the 1950s. In 2004, to commemorate their love, they established an endowment for the “Love Bridge” outside the University’s Wellness Center. The bridge not only serves to honor their University-found love, but proceeds from the sale of personalized bricks on the Love Bridge support the ’Canes Health Assessment and Motivation Program (CHAMP) endowment established by the Herberts. In 2008, the Herberts gifted $8 million to name The Patti and Allan Herbert Wellness Center on the University of Miami’s Coral Gables campus. Allan also serves on the University’s Board of Trustees and the Frost School of Music’s Board of Advisors. Patti and Allan Herbert have long been involved in the arts scene in Miami. In 2012, they gave $500,000 to the Frost School of Music to create the Patti and Allan Herbert Endowed MusicReach Student Support Fund. In 2017, they gifted over $1 million to rename and endow the Patti and Allan Herbert Frost School of Music Program at Salzburg. The Herberts have both had successful careers. Allan as a group executive and insurance company president at Teledyne, and Patti at the Grubb & Ellis commercial real estate firm. Recently, they renovated the historic Richmond Hotel in Miami Beach, which they continue to own and operate. They are recipients of the UM Alumni Association Henry King Stanford Alumni of the Year Award (2004) and the UM Alumni Association Green: Outstanding Fundraiser Award (2008). They are also members of Iron Arrow.